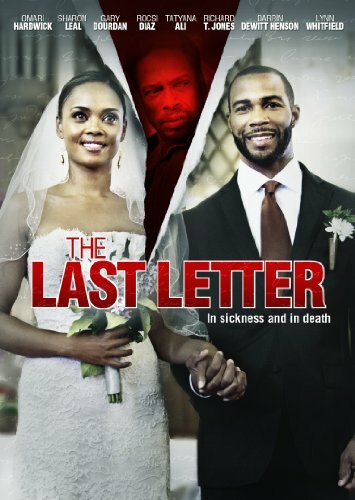 LOS ANGELES (October 31, 2013) - One Village Entertainment, an RLJ Entertainment (NASDAQ: RLJE) brand, brings you The Last Letter on DVD and digital download December 17, 2013. The Last Letter tells the story of a newly married couple whose relationship is put to the test when the wife's secretive past comes back to haunt them. Sharon Leal (Dreamgirls) and Omari Hardwick (Sparkle) head an all-star cast as newlyweds Catherine and Michael. The couple's marriage is challenged by Michael's disapproving mother (Lynn Whitfield, The Josephine Baker Story) and Catherine's own terrifying secret: a crippling sleep disorder that blurs nightmare and reality. When an incident from her past threatens to ruin her future, she turns to her foster brother and closest confidant, George (Gary Dourdan, CSI), who vows they will stick together...no matter what! Richard T. Jones (Why Did I Get Married? ), Tatyana Ali (The Fresh Prince of Bel-Air), Bill Cobbs (The Bodyguard) and Rocsi (Entertainment Tonight) costar in this twisted, psychological thriller from award-winning writer-director Paul D. Hannah (The Marriage Chronicles). Launched in 2007, One Village Entertainment is a part of the Image division of RLJ Entertainment devoted to the development, production and acquisition of feature films, comedy specials, stage plays, documentaries and music content targeting the African-American consumer and urban market. The programming is distributed across multiple platforms including theatrical, broadcast, Blu-ray(TM)/DVD, digital streaming and downloading. Among the more than 125 titles that carry the One Village imprimatur are live stand-up performances featuring Kevin Hart and Charlie Murphy; documentaries 2 Turntables and a Microphone: The Life and Death of Jam Master Jay and I Ain't Scared of You: A Tribute to Bernie Mac; the feature films American Violet starring Oscar(TM)-nominee Alfre Woodard, All Things Fall Apart featuring 50 Cent, the latest in Spike Lee's Chronicles of Brooklyn Red Hook Summer and the acclaimed theatrical romantic comedy Russ Parr's 35 & Ticking. Bestsellers include the stage play production of What My Husband Doesn't Know by David E. Talbert, who is described by Variety as "the acknowledged kingpin of urban musicals."